NOW WHAT? You’re on your own, and your life feels upside-down. Yet, while you try to make sense of your loss, grief, and out-of-control emotions, you’re also expected to manage the complex logistics of legal, governmental, and financial issues related to death. Yes, you—and only you—are in charge of major decisions regarding wills, trusts, attorneys, taxes, budgets, Social Security, insurance … and on and on. And while you’re drowning in paperwork, you’re also drowning in grief. It’s an overwhelming, brutal double-whammy. Susan Alpert has been exactly where you are. When Larry, her husband of 46 years passed away after a devastating illness, she went through all the stages of grief, depression, confusion, and just plain misery you or someone you love may be feeling right now. 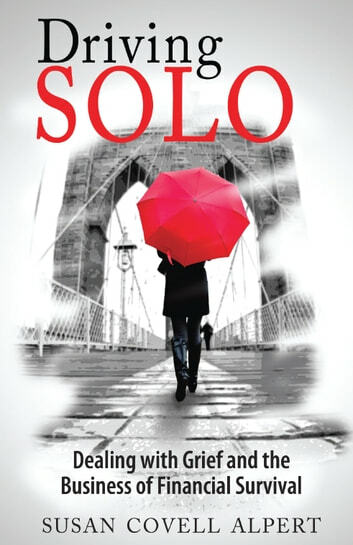 In Driving Solo, Dealing with Grief and the Business of Financial Survival, she chronicles her journey from hearing that her husband has a life threatening disease, to the day he died, through hitting rock-bottom, to ultimately redefining herself and regaining control over her life. Despite having owned and operated multi-million-dollar businesses, Susan was completely unprepared for what she now calls “The Business of Grief.” What do you file first? To whom do you reach out for help? Who do you trust? Which government and financial institutions do you need to notify, and when? And how do you manage these responsibilities when you can barely get out of bed in the morning? The book is both a love story and a tale of survival. The bonus is that in a practical, directed method Susan shows the reader how one can get through the aloneness, fear and sense of feeling completely adrift. This is the lifeline you have been looking for. The first part of the book will help you validate your sanity, the second part, the step by step manual, will save your financial life. FIRST AID FOR IGNORANCE: How to Survive Getting an Education and Stay Off Financial Life Support!